Tea is a meal that really doesn't get enough attention. By and large, if you meet a friend for a cup of tea you go to a coffee shop, snuggle up on a sofa and perhaps indulge in a slightly dry muffin (well, at least in Hong Kong - what is it about over-dry pastries in this place?). In my book, that's not tea. What I'm talking about is the full meal that is afternoon tea - and after sampling Afternoon Tea at The Peninsula, I can tell you it is not overstating it to call it 'a meal'. The Peninsula's indulgent afternoon tea gives you the opportunity to have a sophisticated, relaxed and, well, civilised afternoon, drinking gallons of tea and righting the world. We were warned that the queues on a Sunday can get quite lengthy so we skipped lunch and headed over at about 2.30. This was definitely the right decision because the queue was very short and we got a table relatively quickly. Having said that, it is actually quite nice spending a bit of time in the queue because it gives you a good opportunity to indiscreetly gawp at the hotel's opulent lobby - and, of course, at the other patrons sipping their darjeeling. Despite being huge, the lobby has a great atmosphere, enhanced by the string quartet that played throughout the afternoon. There is enough hustle and bustle to take away any uncomfortable formality but you are still left with a nice level of pomp and circumstance. The food arrives on a three tiered platter and involves everything you could wish for from absolutely brilliant scones with clotted cream and jam, to dainty smoked salmon or cucumber sandwiches, to mini-quiches to cakes and truffles. Despite our best efforts - and we did try pretty hard - we didn't make that big a dent on the collection. Everything, as you'd expect from The Peninsula, was of a very high standard although C. and D. were particularly enthusiastic about the mushroom 'sausage rolls' (which naturally I couldn't verify because I think all mushrooms are intrinsically wrong!). In case we felt hard done by, the waiters also bought a 'pudding' of tiramisu. The tiramisu was not really tiramisu, it was a pistachio cream pudding. Sorry to jump back on my mini-bandwagon here but seriously, does nowhere do good tiramisu in Hong Kong - one with plenty of coffee and booze? I'm searching high and low to no avail. I know that Afternoon Tea at The Peninsula tends to be something that you do when you have guests in town but I'm now a convert to a bit of indulgence just because. It was such a lovely, relaxing experience (they didn't rush us one bit, regularly refilling our silver tea-pots). Wonderful. 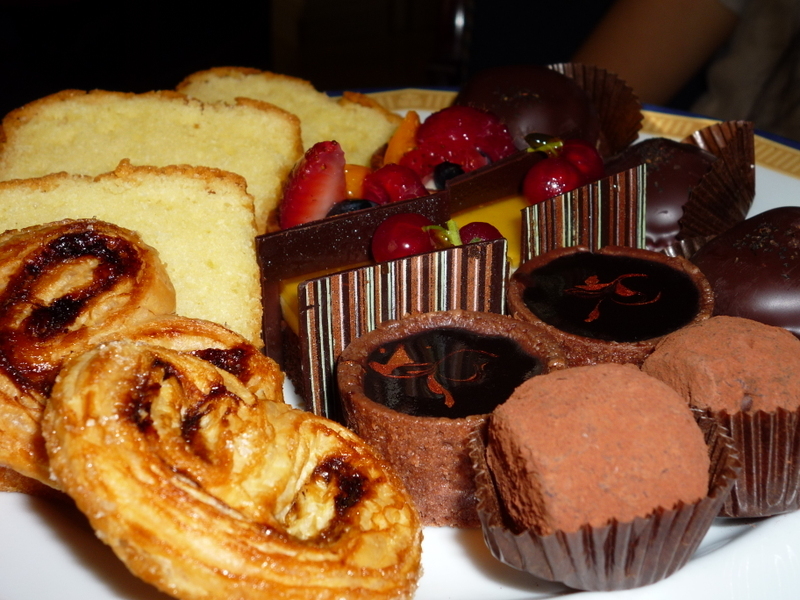 To celebrate the fact that E. and I are now work room-mates, we decided to try out the patisserie at L'Atelier de Joel Robuchon for a mid-afternoon sugar buzz. This was a mistake. The cakes are so unbelievably good that we're now totally and utterly addicted! The patisserie is hidden away on the third floor of The Landmark and is therefore never as busy as the two nearby Starbucks (although this is probably as much to do with the fact that it is considerably more expensive). The actual sitting in area is rather small but they also have tables lined up on the edge of the balcony overlooking The Landmark's atrium - perfectly acceptable but lacking the drama of the black and red design in the patisserie. The counter contains a vast array of different individual sized cakes and resisting the inclination to sample them all, I opted for the chocolate orange mousse cake. The orange flavouring was natural and not overpowering. There is something about me that whenever I go into a cake shop, for reasons best known to myself, I'm unable to not order a chocolate cake of some form. Naturally this means that I can get terrible food envy. In this case, it was of E.'s tarte au citron which left me a case of the green eyed monster. It was outstanding - a crunchy base and a perfectly tart filling. Indeed, E., somewhat of a cake expert, said that she couldn't believe anywhere would out-do the Mandarin's cakeshop. Should you need a little pick-me-up to improve your productivity in the afternoon, the coffee too was great - really thick and bitter. The only thing downside is an environmental one. I have never seen so much packaging in my life. Each cake comes in a beautiful solid red box, in a bag, with a handful of napkins (although no forks which is rather strange). Still, it adds to the purchase experience and now that I know about it, unless it is a gift, I'll ask for it without the box. 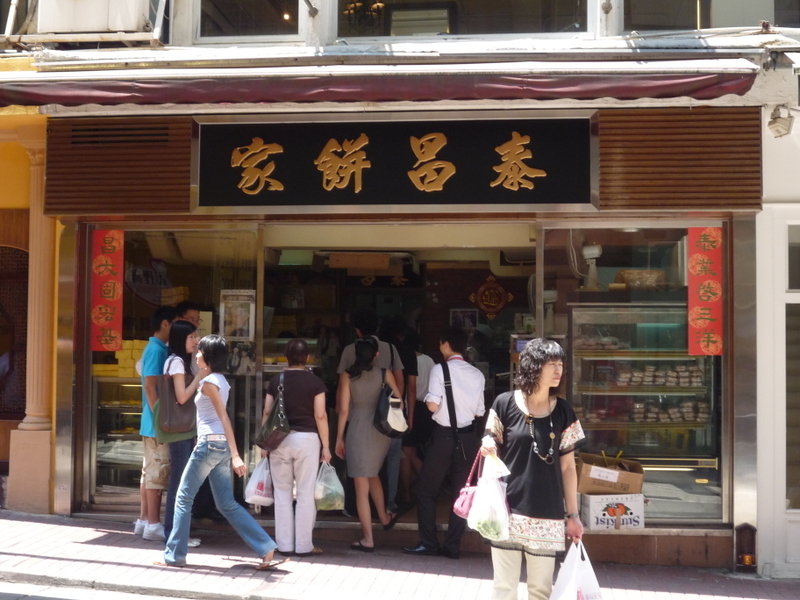 Being efficient, C., my friend and newly appointed guide to all things "local" in terms of HK cuisine, took me straight from Lan Fong Yuen (Link to review) to the Tai Cheong Bakery for lesson no. 2: egg tarts. Tai Cheong Bakery couldn't be described as a particularly controversial place for a lesson on the intricacies of egg tarts, given that Tai Cheong Bakery is world famous as having been Chris Patten's favourite place for egg tarts. Indeed, according to my trusted source (Wiki), the egg tarts at Tai Cheong became known as "Fei-Paang egg tarts" (or "Fat Patten's egg tarts"). Clearly, a warning to us all about the dangers of one too many egg tarts and, to be honest, having tried one, I can quite clearly see how you could over-indulge. The egg tarts, completely different to Macau's own form of the delicacy, were lovely. The pastry around the bright yellow custard is thick, supporting the soft, silky smooth filling. If you need a sweet, but not over-bearingly so, boost in the afternoon, these are the perfect solution. Plus, despite various mutterings from C. about inflation, the egg tarts are only HK$5 each which makes them great value as and when the cravings hit. And I tell you now, once you've had one, the cravings will come....!